In the heart of the Allegheny Mountains, Hot Springs is the ideal getaway for couples and families alike. Featuring wooded seclusion and stunning views, guests can explore the trails of Douthat State Park, fish for trout in Lake Moomaw, and soak in the waters of the Jefferson Pools. The lush, rolling mountains will provide the perfect backdrop for your much needed getaway. Our handpicked homes come with access to the Warm Springs Dairy Community Center, complete with a fitness center, spa, sauna, game room, and pools. On-site, the Milk House Market prepares gourmet sandwiches and treats, and can even prepare a personalized picnic basket for your day in the state park. Hot Springs is a little slice of heaven with everything you need to perfect your dream getaway. 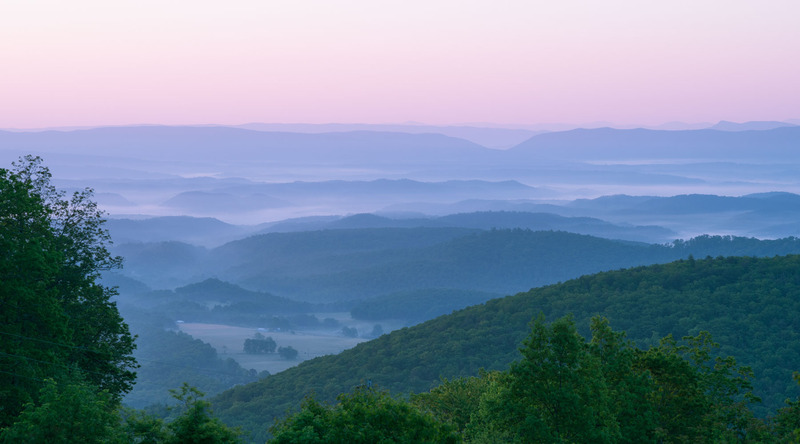 Admire stunning views of Virginia's Allegheny Mountains while enjoying the great outdoors. This 1.4 mile hike offers a challenging trek and offers a breathtaking, well-deserved 180-degree view from the overlook. Pick up a picnic lunch from the Milk House Market and make a day of it. Soothe your tired muscles with a soak in the natural mineral waters of the Jefferson Pools. A local staple for over 200 years, these pools are the perfect way to reward youselves after a day on the trails. End your evening with casual, Italian dining at Cucci's on the Varsity on Sam Snead Highway. Known for traditional favorites, and homemade dressings, soups, sandwiches you're sure to leave with satisfied taste buds. Take advantage of the boundless beauty in Bath County and explore the park. Choose to hike one of the many trails, admire the fantastic Lake Moomaw, or settle on a quiet bank for some fishing. The opportunity for fun and excitement are endless in Douthat. The Douthat Lake and adjoining Wilson Creek are stocked with trout on a regular basis to accommodate your fishing needs. Be sure to have a valid Virginia State fishing license before your trip, as it is required to fish in the park. Appease your hunger with a visit to the Milk House Market. Choose from a variety of house-made sandwiches and salads, and top off your meal with locally made ice cream from the Homestead Creamery. A scenic walk along the river to the Hidden Valley Dispersed Recreational Area is the best way to start the day. Tucked in the George Washington & Jefferson National Forests, this stunning valley attracts visitors from across the country to enjoy the quiet seclusion. Visitors can fish in the Jackson River, picnic under the shade of the trees, or explore the many hiking trails on foot, bike, or horse. Spend the afternoon enjoying the on-site amenities at the Natural Retreats' very own Old Dairy. Once the epicenter of Virginia's dairy production, today, it has been revamped to cater to our guests' needs, complete with a fitness center, a large, outdoor pool, and a game room. Complete your stay with a delectable dinner at a local favorite. With a variety of options to appeal to all and the finest selections of wine in Western Virginia, you're sure you end your Hot Springs visit on a high note. I love exploring on horseback, and the food at the Milk House Market. My kids love the game room in the Old Dairy Community Center. " Tucked in the Allegheny Mountains, Bath County offers gorgeous views, exciting adventures, cozy, handpicked homes, and a wide variety of activities for the whole family. Colleen possesses a deep love of the outdoors, specifically horseback riding, travel, and hospitality. She is excited to immerse herself into, and learn about, new cultures and customs.